Jameson runs two visitor centres in Ireland: one in Dublin (in the old Jameson Distillery), and one in Cork (in the old Midleton Distillery, near where Jameson is made today). Both of these offer for sale exclusive "Distillery Reserve" whiskeys that can be purchased nowhere else. At the most recent Irish Whiskey Society tasting, we sampled the two current Reserves, plus the few that came before them. I admit I was quite underwhelmed when I heard this theme proposed because I assumed they would all be much the same whiskey with different labels. I was very wrong, but not alone in making this mistake. They are generally "under-rated" according to our hosts for the night, David Byrne and Liam Donegan of Irish Distillers (IDL). Together, the Reserves sell about 2,200 cases (25,000 bottles) annually, 60% of those in Dublin. Compare that with standard Jameson, which sold 440,000 cases last December alone. For IDL, these small bottlings are regarded as an opportunity to illustrate the evolving distillery character. There have been three Midleton Visitor Centre Reserves (1992-2000, 2000-2007 and 2007 to date) and two Dublin Visitor Centre Reserves (1999-2007 and 2007 to date). All are 12 years old. There were significant differences in taste between the various bottlings. Some of this was due to different ratios of sherry and bourbon casks, or different distillates (they can twiddle the knobs in the plant to draw off a heavier or lighter spirit as required). But some was due to evolving practices within the distillery. For example, about 15 years ago, they put renewed effort into wood management, ie quality control of the casks they use to mature their spirit. This has a perceptible effect on the final product. Some of the whiskeys I rated highly, some I didn't. Of the two current Reserves, the Midleton one is by far the best. I have a bottle and would recommend it to anyone touring the distillery in Cork. The Dublin one I had not tried before and I found a significant off-note in it which would deter me from investing in a whole bottle. Comparing notes afterwards, I was not the only one that night to find the taste off-putting. The Midleton version though: excellent! 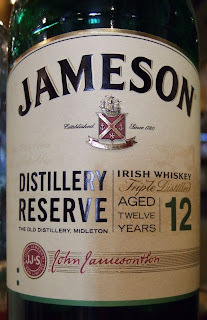 We also tried a blend created for the French retailer, Maison du Whisky, in 2005, called Jameson Distiller's Selection. This was really fine. 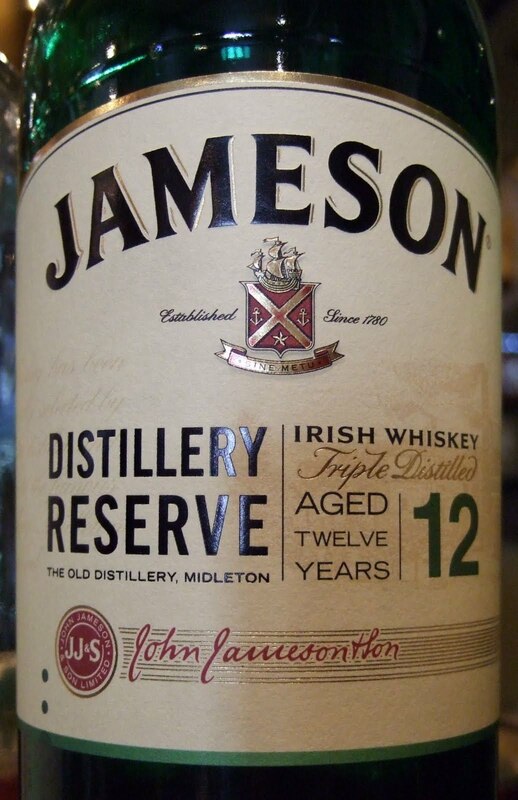 It was described both as purely bourbon-matured and as matching the profile of standard Jameson, only older at 13-14 years. That seems like a contradiction to me since standard Jameson has a sherry component. Whatever about that, it was a great whiskey, but no longer available. There was more interesting business that night, including a taste of a brand new whiskey about to be released. But we are under a strict injunction to say nothing about that until later in the week. Stay tuned!